Representatives attending the 25th ASEAN Regional Forum Retreat pose for a group photograph in Singapore on August 4, 2018. 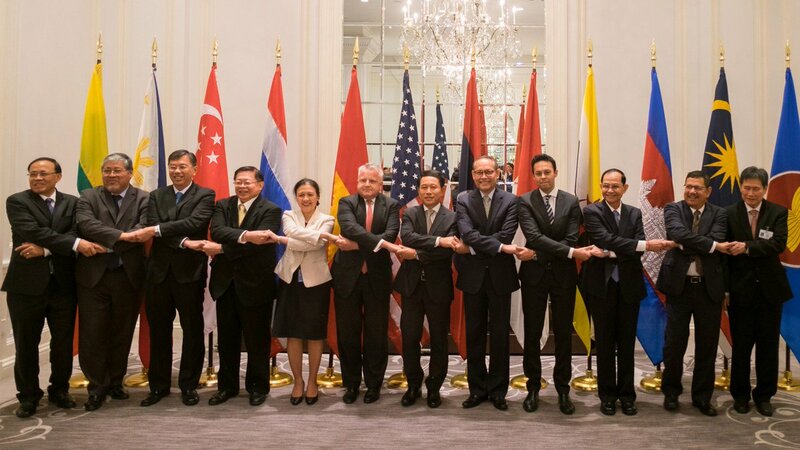 At the 6th U.S.-ASEAN Summit and the 33rd East Asia Summit this week in Singapore, the United States and ten nations that comprise ASEAN will reaffirm our strategic partnership. The United States and these ten nations will discuss our shared commitment to a free and open Indo-Pacific region, in which independent nations with diverse cultures and aspirations can prosper side-by-side in freedom, peace, and prosperity. The United States celebrates with its partners 41 years of close U.S.-ASEAN relations, and maintains an enduring commitment to this forward-looking multilateral organization. President Trump attended the 2017 U.S.-ASEAN Summit in the Philippines. The United States is a Pacific nation, and we remain committed to ASEAN centrality as a cornerstone of our vision to advance a free and open Indo-Pacific. U.S.-ASEAN cooperation makes the region more peaceful and secure, a message that Vice President Pence will underscore during his participation in the East Asia Summit and 6th US-ASEAN Summit in Singapore. We are cooperating on pressing security issues, including efforts to achieve North Korea’s denuclearization and to promote maritime security in the South China Sea. The U.S.-ASEAN partnership also addresses transnational challenges, such as trafficking in persons, disaster management, cybersecurity, and counterterrorism. Our shared goals and ambitions make us firmly committed to ASEAN in the long-term. Secretary Pompeo made good on that commitment at Ministerial-level meetings in August in Singapore, where he announced significant investments that advance peace and prosperity in the Indo-Pacific, including investments that support ASEAN and other regional institutions. Secretary Pompeo at the ASEAN-related Ministerial Meeting of the Lower Mekong Initiative. Mutually beneficial economic engagement has long been an important part of the U.S.-ASEAN relationship. The United States supports the ASEAN Economic Community so that the ten member states can reach their own vision for a single market and production base with free movement of goods, services, capital, and skilled labor. One way in which the United States is working to achieve this goal is via the ASEAN Connectivity through Trade and Investment (ACTI) initiative. This five-­year project of the U.S. Agency for International Development (USAID) and the U.S. Department of State accelerates implementation of select components of the ASEAN Economic Community and the ASEAN-­U.S. Trade and Investment Framework Arrangement. Adopting free, transparent, sustainable, and inclusive trade practices as ASEAN moves toward economic integration will benefit the Southeast Asia member states, as well as the United States. Deputy Secretary Sullivan meeting with the ten member countries of ASEAN on the margins of UNGA in New York City. Our commitment to ASEAN and its members extends beyond summits and other diplomatic settings. When an earthquake and tsunami struck Central Sulawesi, Indonesia, in September, killing more than 2,000 and injuring and displacing thousands more, we responded by providing more than $11 million in humanitarian assistance. USAID provided water, hygiene kits, blankets, safe spaces for children, and emergency shelter materials, including 2,210 rolls of heavy-duty plastic sheeting, which was enough to provide for the emergency shelter needs of 110,500 people. The Department of Defense sent three C-130 aircraft to support USAID’s mission, and the C-130s delivered nearly 600 metric tons of relief supplies to the affected area. The ASEAN Humanitarian Center in Jakarta, which benefits from U.S. assistance and support, also responded to the crisis. We stood with the people of Indonesia during this challenging time, and we will continue to stand with the people of the ASEAN nations in the future to ensure we all move forward together. 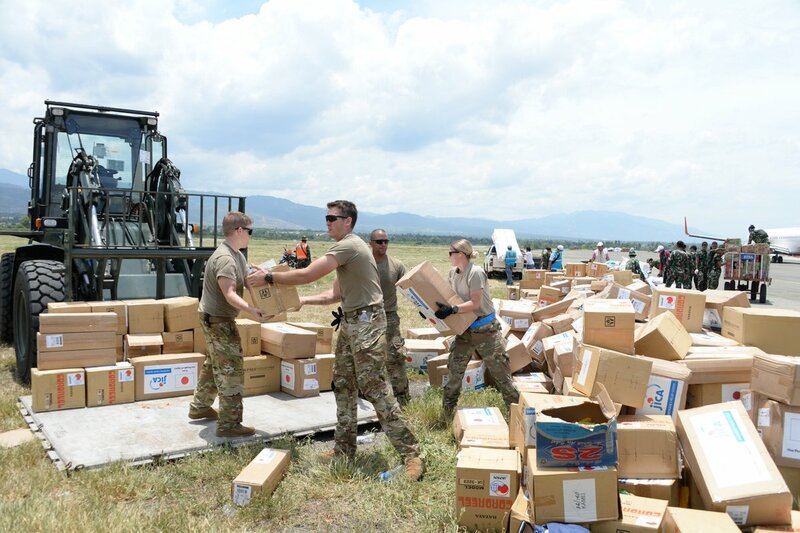 USAID in coordination with the U.S. Military brought over 41 metric tons of relief supplies to those affected by the Indonesia earthquake and tsunami. ASEAN’s theme for 2018 is “resilience and innovation.” The Young Southeast Asian Leaders Initiative (YSEALI), a U.S. program that builds the leadership capabilities of youth in the region and promotes cross-border cooperation to solve regional and global challenges, is a perfect example of this theme in action. This year, for example, YSEALI members in Brunei hosted a “Combating Trafficking in Persons” conference at Universiti Brunei Darussalam to raise awareness about human trafficking and the importance of preventing the country from becoming a destination for trafficking and the exploitation of persons, especially youth. In Indonesia, YSEALI delegates participated in a Marine Debris Expedition Regional Workshop, and pitched action plans to combat marine debris. The 2018 YSEALI Summit will take place December 3-5 in Singapore, bringing together 150 participants from across ASEAN countries and the United States. Ambassador Sung Kim at the 2017 YSEALI Summit. For the last 41 years, the United States has partnered with ASEAN and its member states on economic engagement, security, rule of law, sustainable development, human rights, and people-to-people programming. We look forward to working with our ASEAN partners in Singapore and beyond to strengthen an enduring partnership and cooperation that is rooted in our shared interests and values. About the Author: W. Patrick Murphy serves as Principal Deputy Assistant Secretary in the Bureau of East Asia and Pacific Affairs at the U.S. Department of State. W. Patrick Murphy serves as Principal Deputy Assistant Secretary in the Bureau of East Asia and Pacific Affairs at the U.S. Department of State.